Those are amazing pictures! Thanks for sharing them! Happy 70th Birthday to the greatest guitarist ever! Thank you for all the great music, and for being such an inspiration to so many musicians. We love you Jimmy!! Happy Birthday, Jonesy, and many more!! ^ That is definitely going to be my new desktop wallpaper. 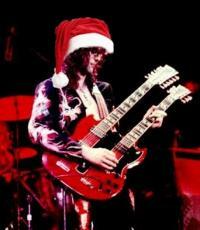 HAPPY NEW YEAR TO ALL LED ZEPPELIN FANS. That was a very cool message from Jimmy. I'm sure those "companion discs" will be interesting! I had a bigger problem with The Edge being in the movie than Jack White, to be honest. Of all the guitarists from the 80's-90's era, they chose him?! He's a mediocre guitarist who never did anything that was groundbreaking or different (besides not knowing how to play without using delay for everything), unlike Jimmy Page and Jack White. Why they chose to have him in there alongside the two of them, I have no idea. Maybe he was there for comic relief.